Today, Twitter is one of the most effective platforms for brands to interact with customers. With an average number of monthly active users at a staggering number of 328 million, a business can achieve a fantastic exposure and increase the awareness on the international level. However, with over 500 million new tweets being sent every day, it could be challenging to stand out and attract the attention of the target audience. How do you get yourself noticed? One of the most effective ways to accomplish this mission is to use videos. Twitter recently released a report showing that its video views had grown by 220% in the 12 months previous. Building upon the numbers like that, some marketers predict business video uploads to social media will triple by 2018. Are you prepared for the big changes that are coming? Read about four ways to use video on Twitter that will help you to boost your social media efforts without a significant time commitment and expensive equipment. Educational videos that provide a unique expertise and knowledge are always valued by customers. Besides, how-to videos build trust between the consumer and your business, and help you position yourself as an expert in your niche. If you’re looking for an example of a great how-to video, look no further than Buffer. These guys develop social media scheduling software and are rocking it with video on social. For instance, this how-to video is quite short (only about 2 min) but catches our attention immediately due to two reasons: 1) it is showing a real person talking right to us at the camera; 2) it begins with a powerful message. A combination of short text and video works best for Twitter. Bonus tip: drive more traffic to your website by encouraging the viewers to click on the post to learn more. Also, whenever possible, try featuring people on camera. For some mysterious reason, people like looking at other people. Stories leave a long-lasting impression in the minds of viewers. Next time they look for a great brand to buy from, they will remember your story. Check out this video in which Nike tells the story of Kevin Durant, arguably one of the best basketball players on the planet. Everyone who loves basketball would love to watch this video and click on the link to go to the full documentary. Now, that’s more traffic! Basically, a product explainer is a short video that introduces your product. Because what is better for raising awareness about a new product than showing what it can do with a video? A product explainer is a great way to tell your customers about a new product that you released, new features, or other important updates in the product. The video needs to be short because no one likes long explainers. For some inspiration, take a look at this video by Mention, a tool for media monitoring. Not only did they combine text with a sprinkle of emojis in it and video but they also pinned this video to the top of their Twitter page. Now, this is the first thing anyone sees when they visit their Twitter account. They also wrote a whole blog post on how they created the product explainer. Bonus tip: a good product video needs a good script. When working on a script, there is one thing you should keep in mind. Your customers don’t care about your product, they care about what’s in there for them. So try to focus your video on the benefits, not features. People love to be inspired. This uplifting feeling that they get when they hear or watch something inspirational should not be underestimated by social media marketers. After all, social media is all about being social, isn’t it? In this video, Buffer inspires people to never stop fighting, no matter the age. Notice the number of likes and retweets it got! Bonus tip: it’s a good idea to post inspirational videos on Twitter on a certain day, that you can call “Inspirational Friday”, for instance. 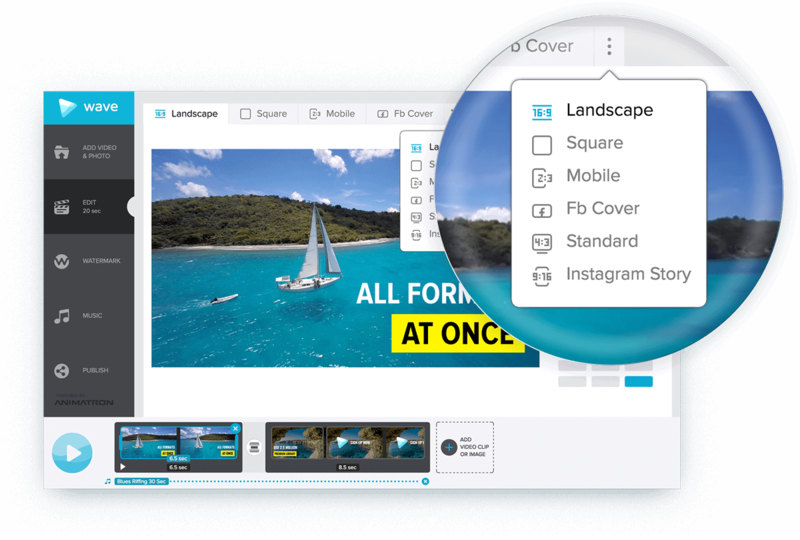 wave.video is an easy-to-use online video maker that comes with a huge benefit of the built-in 2.5 million asset library of professional video clips and images. If you don’t have a video of your own to start with, no worries: just fine one in wave.video. You can also upload your own media like images, video and audio files, to make your video truly great. Another cool feature is that you can instantly make a video in 6 (and we mean, six!) different formats, including Facebook cover, Instagram Stories, square, and landscape. Ad Mockup Generator is a great tool for creating free, downloadable ad mockups for various social media including Twitter and get instant previews. Buffer for Video – upload your video one time to share on a specific time to Twitter and other social networks. The video will appear natively regardless of which network you choose, thus fitting with the style and format. After sharing, the users are able to review full analytics on the update. Creating texts to accompany videos is just as important to deliver the message in the right way. Assignmethehelper can be used to produce effective, appealing texts to get the viewers interested in the video content. If you want more engagement from your audience, try posting a GIF instead of a regular video. Make a GIF provides a collection of ready-to-use GIFs as well as an editor to create your own. Twitter is definitely a great place for acquiring and retaining customers through videos, so use these ways to inspire you and boost the impact of your campaigns. Understanding the methods of using video in Twitter videos and ads and applying these methods can be vital to driving profits and achieving a campaign’s goals. Just don’t forget to follow video requirements for Twitter to ensure yours appear great. Alright, time to take your video content to the next level! About the author: Lucy Benton is a marketing specialist, business consultant who finds her passion in expressing own thoughts as a blogger, and currently works at Awriter. She is constantly looking for the ways to improve her skills and expertise. If you’re interested in working with Lucy, you can find her on FaceBook and Twitter.